Young in spirit, ageless in pride. April 30, 2018 and run through Monday, September 24, 2018. If Monday is a holiday, the brush pick-up will be on Tuesday. During this period, only brush will be picked up (NO grass or leaves). If you hire a private contractor for any job on your property, they are responsible to remove all debris. The “Just Mow it” program continues to be very successful. Please help keep this program a success by returning your clippings to your lawn. Do not bag grass clippings for garbage collection as Modern Disposal will not pick it up. There are concrete bunkers located at 707 Nancy Price Drive for you to take these clippings if necessary. Residents (only) are able to dispose of twigs, grass, leaves and branches here. Electronic recycling is available for Village of Youngstown residents at the Town of Porter Highway Department located at 1800 Braley Road. Please call (716)-791-3831 from 7:00 a.m. – 3:30 p.m. before you bring your electronic recycling to them. Garbage will be picked up on Friday of each week unless a holiday occurs within that week. The holidays observed by Modern are listed below. 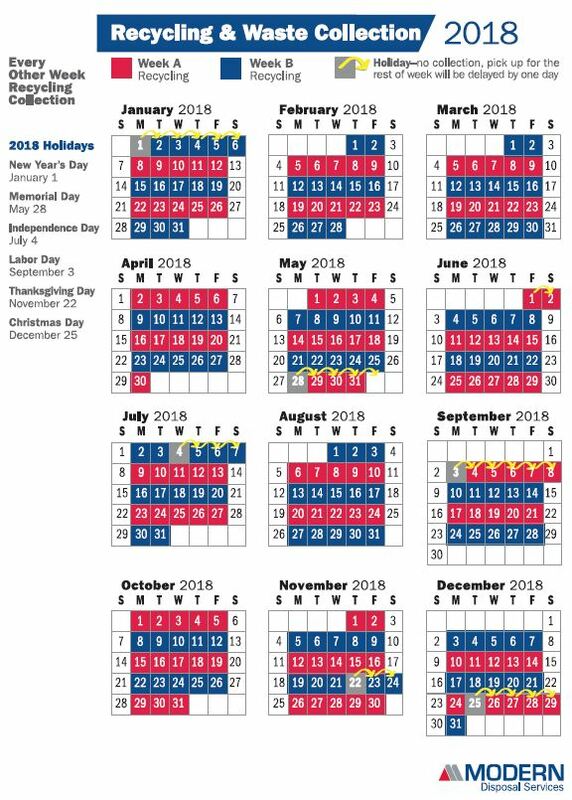 These are the only holidays in 2018 that will affect your refuse and recyling collection. In case of postponement due to unforseen obstacles, Modern will publish a notice in the Gazette. Large garbage items will be picked up at a rate of one (1) unit per week. Modern will not pick up any remodeling debris – you must contract for a dumpster. Modern will pick up scrap metal and white goods (refrigerators, freezers, air conditioners, etc.). Please remember that all items containing Freon must have certified removal and be tagged as such. You will need to contact Modern to schedule a date to have your items picked up. Modern’s phone number is 1-800-330-7107. Please note: there is a three (3) can/bag (35 gal.) limit per week. Thank you to all our residents for making these programs so successful and assisting in keeping our disposal costs down and environment green! © 2009-2019. Village of Youngstown. All Rights Reserved.